Training can be as a part of a personal development/self healing program or to become qualified as a Practitioner and earn a living by making a difference to other people’s lives. § Commitment to continuing professional development and sign up to code of conduct. 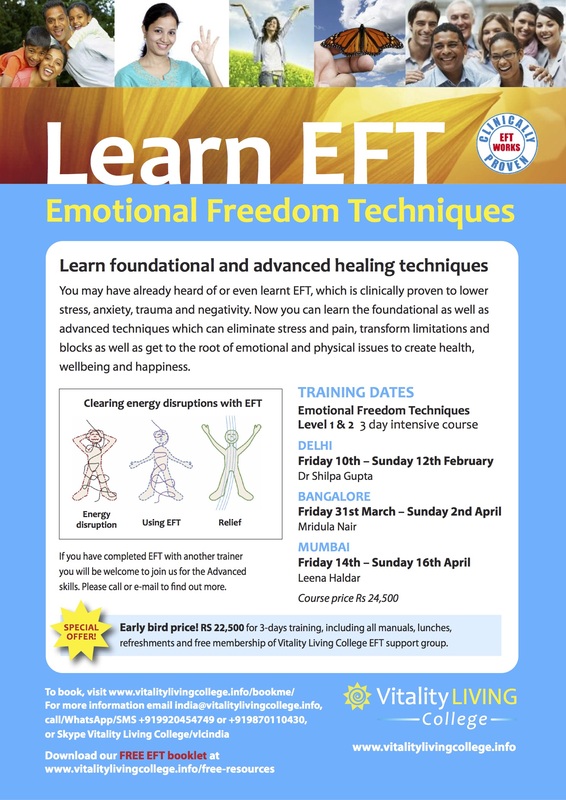 Program: EFT Level 1 & 2 Three Days Intensive Training Mumbai with Vitality Living College Accredited Trainer Leena Haldar. For more information download a free booklet on EFT (Emotional Freedom Techniques) along with 6 other breakthrough books. call/What’s App +919920454749, SMS +919820974625 or e-mail india@vitalitylivingcollege.info.